The turkey adventure is almost over, (we have a few frozen ones left). I’m calling it a success, because we are getting great feedback from our customers, and we received an education. Turkey-directed learning is underrated! About six weeks before our processing date at Twin Cities Pack,I decided to call and make sure everything was lined up. The owner said no, someone called and cancelled our appointment. I was able to reschedule for the week before Thanksgiving, but this meant that the turkeys would be frozen. I was in shock, because I knew that many of our customers expected a fresh turkey for Thanksgiving, and may cancel if we no longer offered that option. I was depressed for about a half hour, but then I realized that we could still offer fresh turkeys if we processed on-farm, and customers traveled to the farm to pick one up. 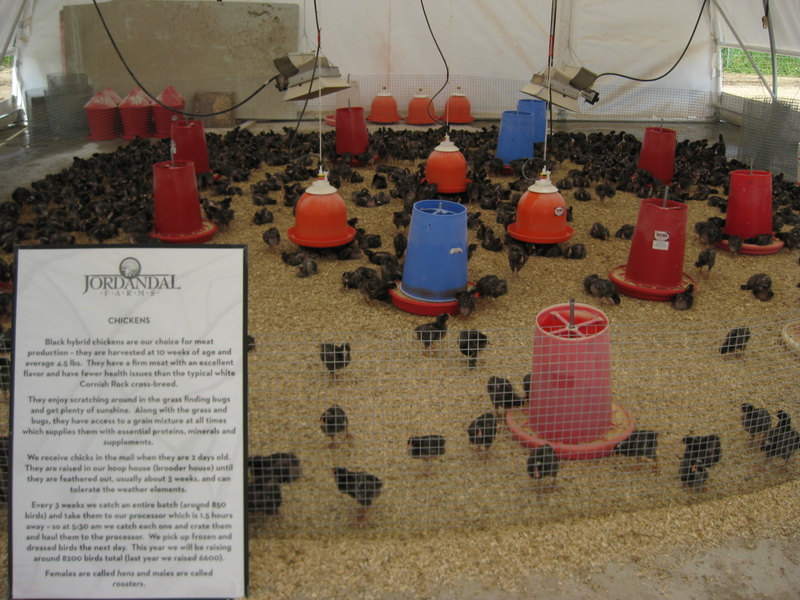 I checked with an Amish neighbor who had the necessary poultry processing equipment, and yes we would be able to rent it from him and he would also provide his expertise. The last poultry I butchered myself was about 20 years ago as a character-building exercise. So we offered two options: a frozen turkey from a state-inspected facility, or drive to the farm for a home-butchered fresh turkey. A few people cancelled, but most stayed with each option split about equally. I took some of the turkeys to Twin Pack and then picked up the birds the next day and delivered to a central point. It went fine. Then the Monday before Thanksgiving dawned, and I did my chores quickly and went and picked up Benny, my Amish neighbor, and his poultry processing equipment. We used a propane tank to heat the water for the scalder. The plucker ran off of hydraulics. I used one of my tractors to run that, but had to change one of the ends of the hydraulic lines, no problem. We set up and began with me doing the killing and scalding, Braden plucking, my Dad and my Uncle Carl doing quality control, and Benny gutting. Braden also learned how to gut as he took a real interest in the whole process. I’m not going to kid you, it was gruesome. A few customers came before I had a chance to clean up. I’m amazed they didn’t jump in their cars and drive away as I looked like something out of a horror movie, with blood spattering my face and glasses. But after I had a chance to clean up I felt better and actually enjoyed the rest of the day as I had a chance to visit with many of our customers and even gave short tours to some of them. It was a great way to end our turkey project, and reminded me why Thanksgiving is my favorite holiday. 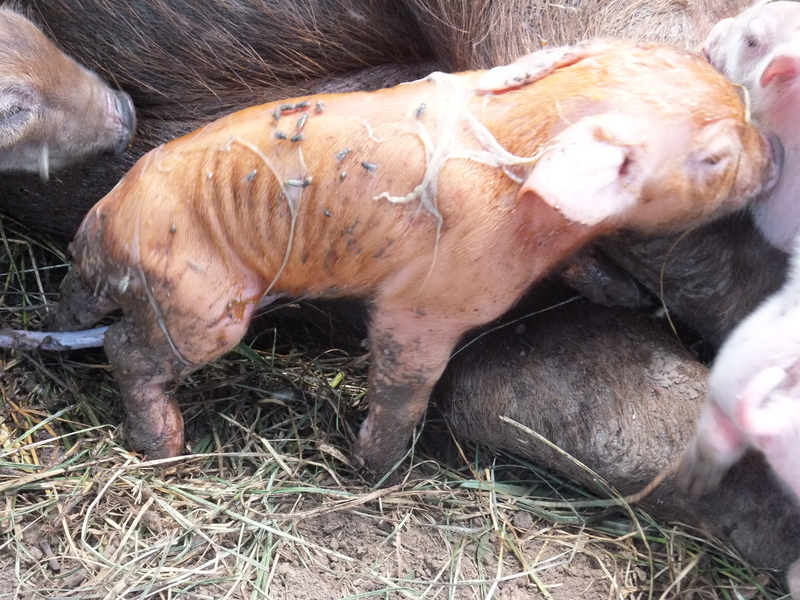 The sow I wrote about earlier, (let’s call her Crinkly-Ear), farrowed. She picked out a shady spot under an oak tree, far away from the rest of the herd. 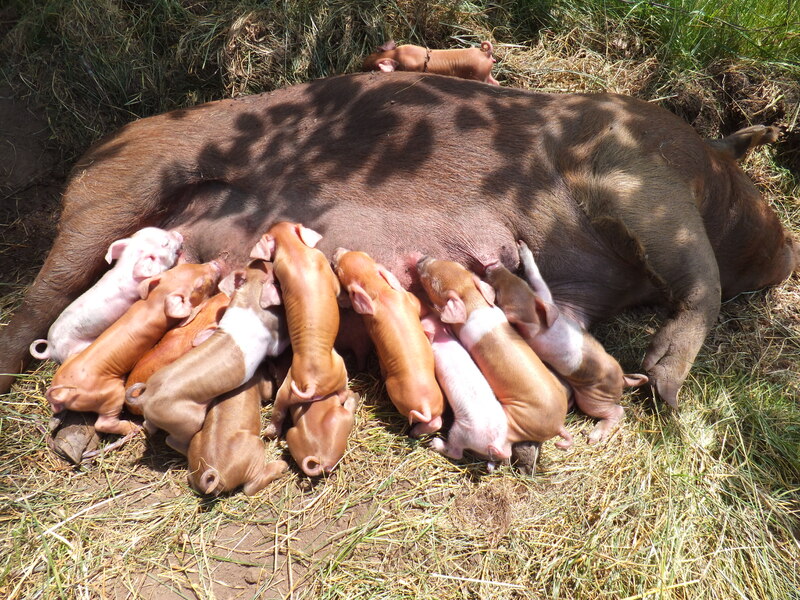 She had twelve beautiful piglets. 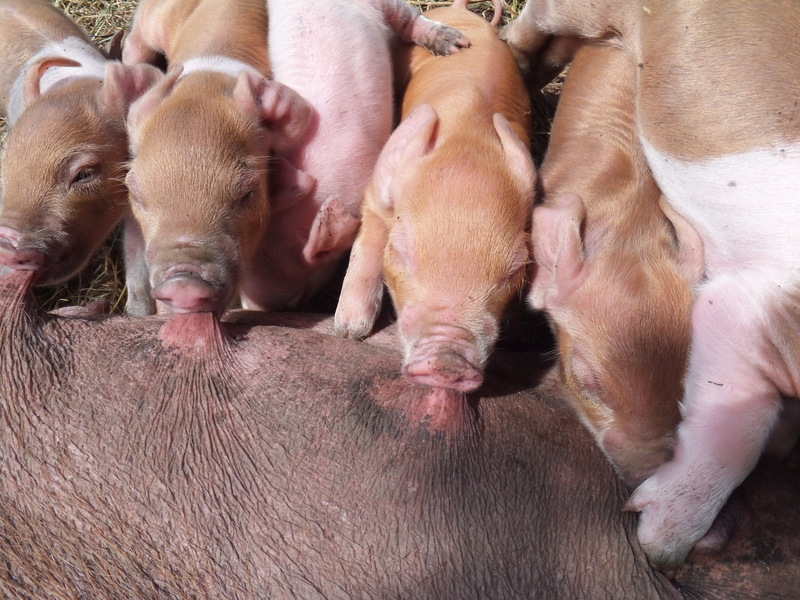 When a piglet is born, it is covered in a thin membrane. It takes a few minutes to dry and rub off. A healthy piglet shakes off the stress of birth rapidly, and is up and struggling with its siblings for a teat. The chef and crew at Dayton Street Grille came for a visit. I love when a restaurant comes for a visit. It shows they aren’t just using the “local” angle for marketing, but really care about the food they’re serving. I took them for a hayrack ride and showed them the cattle grazing and Crinkly-Ear’s litter. They’re holding some day-old piglets in the photo. I drove the tractor and Shepherd provided the color commentary. Then they got the bonus tour because a sow was farrowing up near the barnyard. They got to see me reach in and pull out a piglet that was coming backwards. One guy even touched the slimy newborn. Thank you Dayton Street Grille. Grass-finished steer, ready for butcher. The four steers we butchered this week averaged 1160 pounds live weight, and 615 pounds carcass weight. 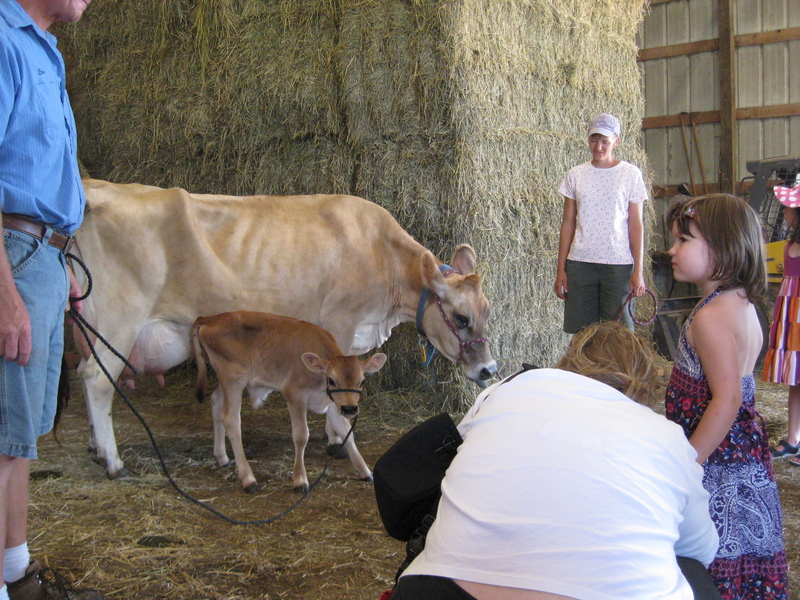 This means they gained an average of roughly a pound and three quarters per day since weaning, October 2010. I’m very happy with this performance. Our customers are as well. We’ve been butchering these yearling steers every few weeks since July, and we haven’t had a complaint, with much repeat business. In July, the steers have been gaining rapidly as they transitioned from winter/late spring hay to the lush May/June pasture. The biggest weigh around a thousand pounds. As the pasture slumps in the heat of summer, the steers are rotated into orchardgrass/alfalfa hay fields to keep their consumption and daily gain up. Below you can see the level of finish, or fat, in the brisket of this steer. 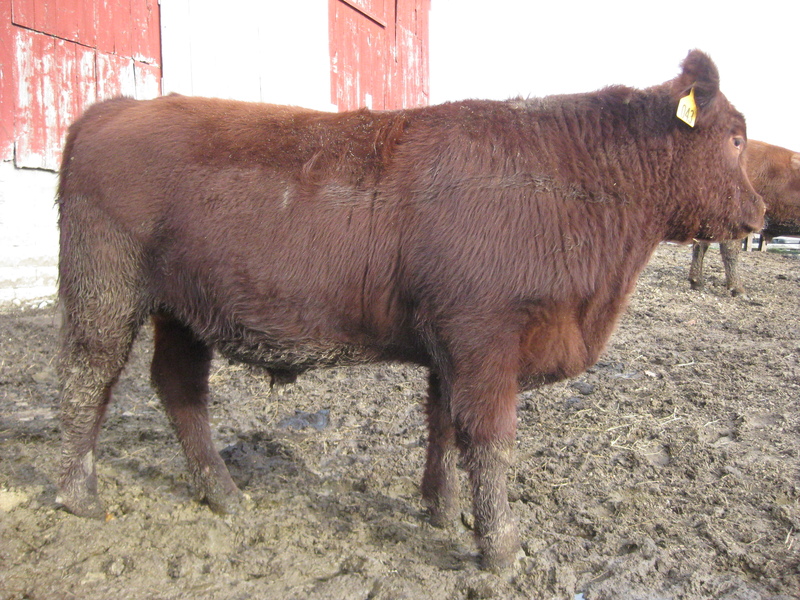 By industry standards this steer is not fat, nor ready to butcher. Most would recommend a few months of corn feeding. But the marbling in the meat is near the select grade. And the meat is tender. And like I said before, we have tons of repeat business. 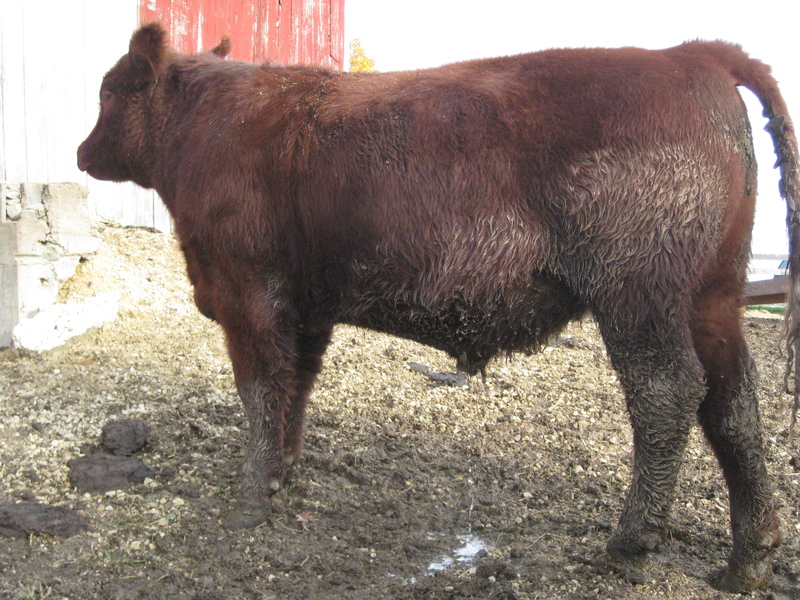 Below is a steer we sold to a farmer who corn-fattens. This photo was taken in September. The steer weighs about 300 pounds more than the steer pictured above. Look at the amount of fat in this steer’s brisket. This is the amount of finish the industry demands. The farmer sold this steer shortly after the photo was taken, and topped his local market. Each of us produced the animal, and meat, our market demanded. 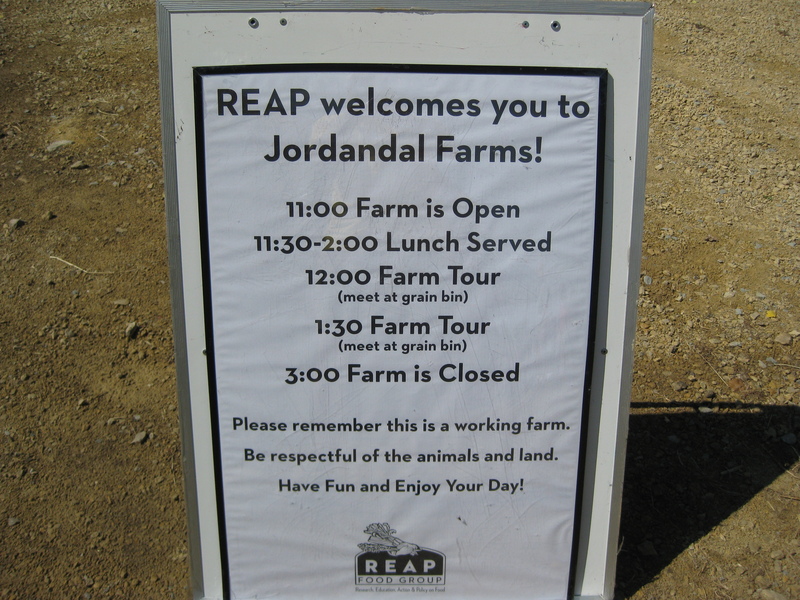 REAP food group, Madison, put on a wonderful “Day at the Farm” at Jordandal Farms, my direct-marketing partners. People turned out in droves. 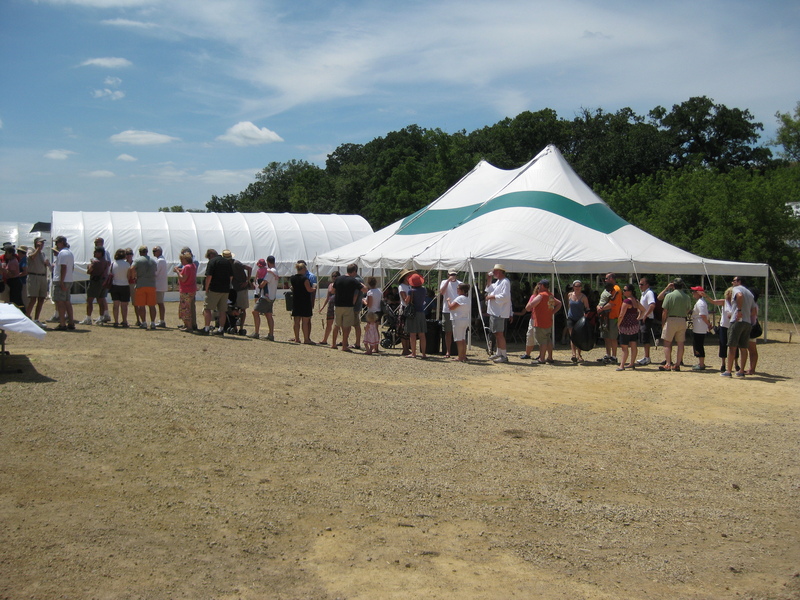 I think people want to visit a farm, but are too shy to ask. Eric and Carrie went all-out showing off their farm. Here is one of Eric’s Jersey cows with her five-day-old calf. Here are baby chicks in the brooder house. Each specific livestock had a sign with pertinent information. 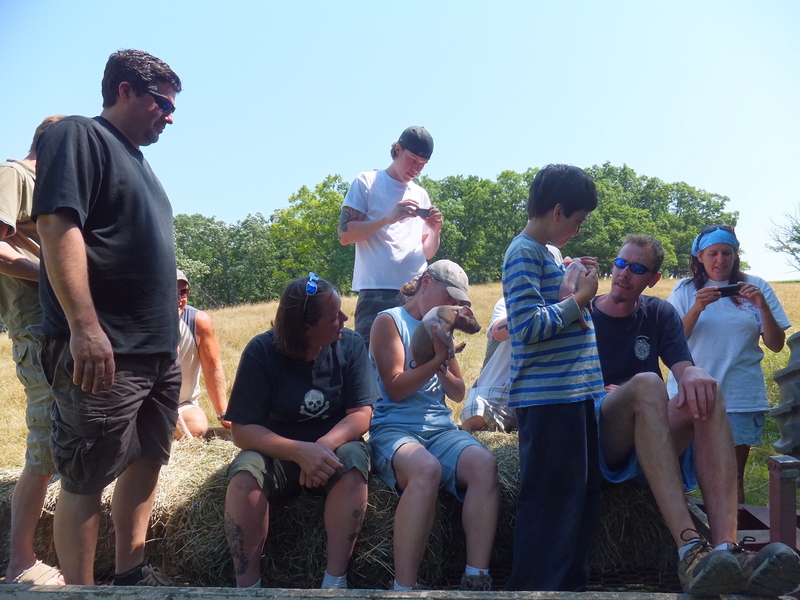 Eric and Carrie showed off their chickens, Jersey dairy cows, and sheep. 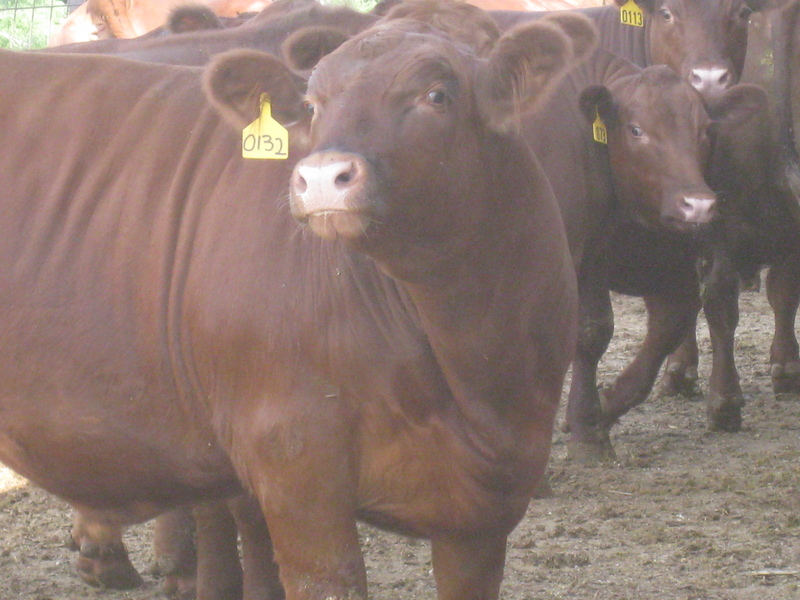 We brought some of our Red Angus cattle and hogs to their farm. Chefs from some of Madison’s finest restaurants prepared an excellent meal. Employees and volunteers from REAP made everything go smoothly. I can’t believe this was the first time they ever tried one of these. 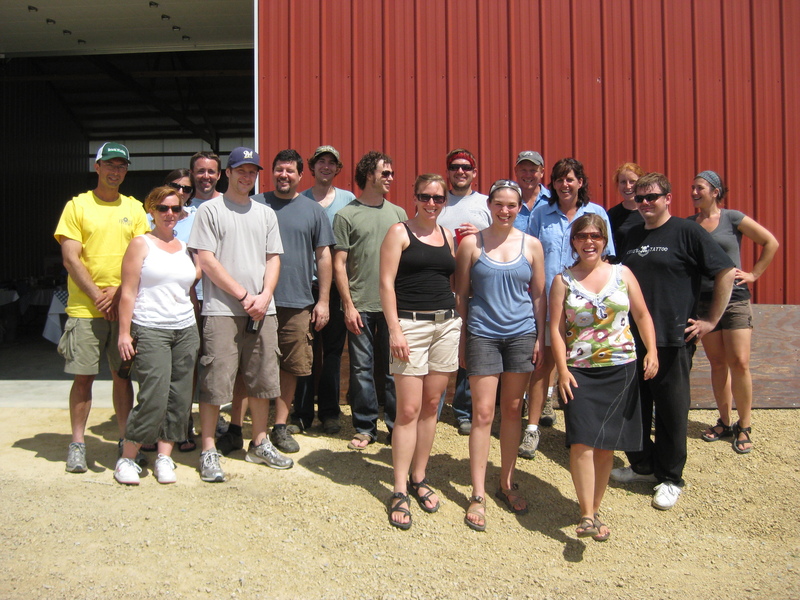 Here we all are after a successful Day at the Farm. Owners and chefs from Restaurant Magnus visited our farms Sunday morning. I applaud them for making the effort and taking the time for a farm visit. It’s fun when someone is interested in what you are doing. Check out their menu. Bold and creative. Direct-marketing continues to introduce me to interesting people. You are currently browsing the archives for the Curious direct-market category.